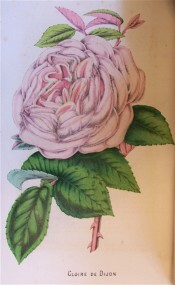 A Tea rose. According to William Paul ‘Gloire de Dijon stands unrivalled and alone’. Flowers yellow, faun and salmon, large, full and globular. Very hardy, it apparently withstood the very severe frosts of 1860-61 in England, when most other roses were killed. [Paul (1863, 1888, 1903), Rivers (1854, 1857, 1863), Amat]. ‘In its foliage, habit and shape, and size of its flowers, it is almost an exact resemblance of the Bourbon Rose ‘Souvenir de la Malmaison’, and, like that fine Rose, it requires dry warm weather to open its flowers to perfection. Its perfume is Tea-like and powerful, and in colour it is quite unique, being tinted with fawn, salmon and rose, and difficult to describe’. Thomas Rivers, in The Gardeners’ Chronicle, 1854. Introduced by Jacotot of Dijon in 1853. ‘Gloire de Dijon’ received Gold Medals at Dijon in 1852 and Paris in 1853. It was figured in the Floricultural Cabinet twice, an unusual accolade. [FC p.52/1854 and p.297/1855, FS f.872/1853]. In the first great National Rose show held in July 1858, ‘Gloire de Dijon’ was listed amongst the roses appearing in multiple (12) winning collections. [Gard. Chron. 1858]. It was described growing in the private garden of Charles Moor, Director of the Sydney botanic Garden, in 1864. [NSW Hort. Mag. vol.1 p.44/1864].